Gareth Long - Education: Hokki Mania! Hokki mania! 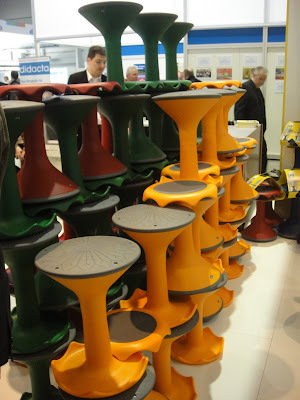 Last September I wrote a post about the launch of the Hokki stool by VS during the cefpi World Conference in San Jose, CA. A few days ago during Didacta in Stuttgart, VS staged a huge promotion of the Hokki - the response was staggering! The Hokki, created for VS by UK Designer John Harding, with it's slightly rounded base, allows for some movement, without being extreme. It allows students to do small movements during class - movement usually increases, not decreases, concentration. Trying to move on conventional stools and chairs is not easy and can result in accidents. The Hokki allows movement. By designing ergonomic furniture that allows some slight movement, we are encouraging the student's ability to concentrate and develop normally. The Hokki, along with the other seats in the VS flexible range adjusts to the subconscious position changes of the student's body and encourages the body to change it self. This 'active' seating has a natural effect on the body's entire posture. They come in a range of sizes so there is one for every sized student. I think they are really comfortable as well as looking great. I often use one - my two daughters, aged 4 and 5 just love sitting on them. 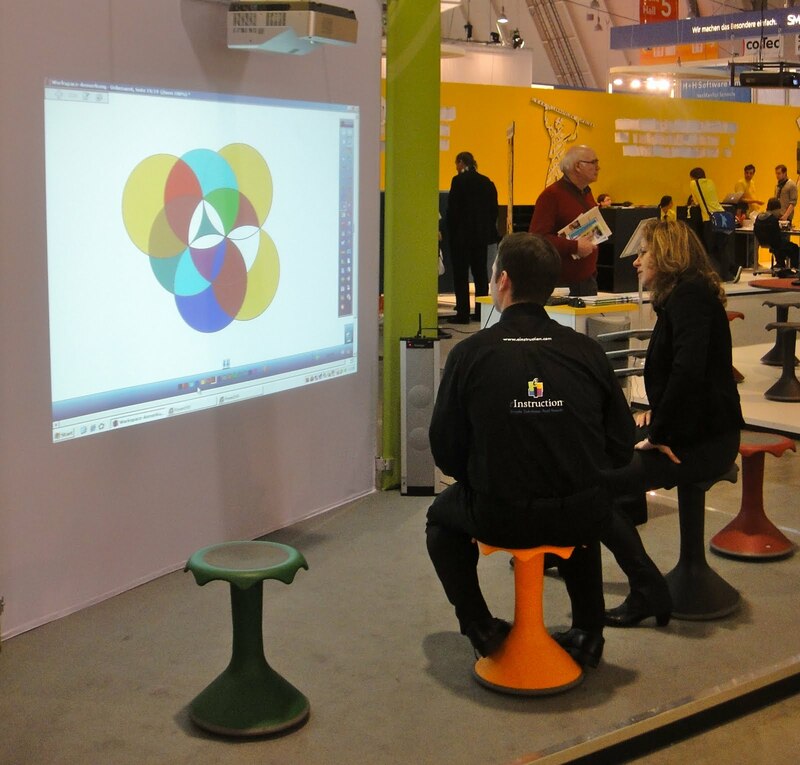 Many teachers visiting Didacta were clearly also convinced. The promotional daily allowance of several hundred Hokki's soon cleared, people all over the show could be seen carrying one or more Hokki, I saw one lady with eight! There were scores of disappointed, / upset people still trying to get them, including those trying to persuade VS to dismantle their 'flying Hokki' display so they could get one. They had to be content with ordering them. Even funnier was how many other exhibitors used Hokki as the seating of choice for people to use whilst watching demonstrations etc. It says it all really! The Hokki is available in the UK already, but do expect to see a big promotional push in the future - they are just FAB!! Even funnier was the number of exhibitors who used the Hokki as seating for their audiences, even though they were nothing to do with VS. Many got 'removed' during the afternoon! BSEC - a quiet affair..